Picture - SPAD S.XIII in the colors and markings of Capt. Eddie Rickenbacker, U.S. 94th Aero Squadron. This aircraft is on display at the National Museum of the U.S. Air Force near Dayton, Ohio. The S.VII had entered service in September of 1916, but by early 1917 it had been surpassed by the latest German fighters, leading French flying ace, Georges Guynemer to lobby for an improved version. SPAD designer Louis Bchereau initially produced the cannon-armed S.XII, which had limited success, and finally the S.XIII. The S.XIII differed from its predecessor by incorporating a number of aerodynamic and other refinements, including larger wings and rudder, a more powerful Hispano-Suiza 8B engine fitted with reduction gearing, driving a larger "right-hand" propeller, and a second 0.303 Vickers machine gun for added firepower. The sum of these improvements was a notable improvement in flight and combat performance. It was faster than its main contemporaries, the British Sopwith Camel and the German Fokker D.VII, and was renowned for its ruggedness and strength in a dive. The manoeuvrability of the type was however relatively poor, especially at low speeds. A steep gliding angle and a very sharp stall made it a difficult aircraft for novice pilots to land safely. It first flew on April 4, 1917, and the following month was already being delivered to the French Air Service. 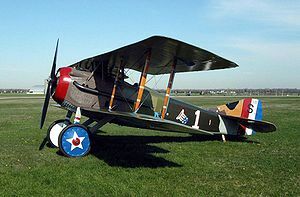 Other Allied forces were quick to adopt the new fighter as well, and nearly half of the 893 purchased for the United States Army Air Service were still in service in 1920. It was also exported to Japan, Poland, and Czechoslovakia after the war. The S.XIII was flown by famous French fighter pilots such as Georges Guynemer and Rene Fonck, and also by Italian ace Francesco Baracca. 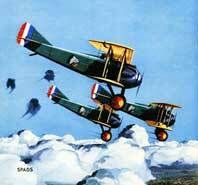 Aces of the United States Army Air Service who flew the Spad XIII include Eddie Rickenbacker (America's leading ace with 26 confirmed victories) and Frank Luke (18 victories). No. 23 Squadron RFC - December 1917-May 1918. Data from Sharpe, 2000. p 272.